Stress is not fun. It's just not fun in any way. This week has just been brutal on the stress meter, and I would very much like it to chill the heck out. Feels like my body and emotions are all ramped up on the stress adrenaline, and it seems I'm one stupid person's comment away from a complete freak out. But my brain feels sort of sane, which is entirely unusual for me. Problem is, my brain is trying to tell the rest of me to chill out, but the rest of me is apparently stubborn and hard of hearing and chooses not to listen. Ugh. Work is ridiculous. There are numerous loooooong stories I could tell you of the immature, manipulative, lying antics that happen daily around here, but honestly, I just don't have the energy for it. What happened to professionalism? Is it really so hard to put your big boy shorts on and work like a grown up? From the second I walk in this place, I can feel my blood pressure going up. My neck starts tensing and I want to throw things. This cannot be healthy. Oh, and did I mention I'm not allowed to socialize? Yeah, got in trouble for that. Even though everyone else is allowed to yell and laugh and punch on each other (stupid boys), my good work friend (who sits two cubes down) and I cannot say a word to each other. We work 10 hour days. You try sitting 5 feet away from one of your only friends in the whole state for 10 hours and not talk to her. I guarantee you will want to throw things. Or kick people. On top of it, I have so much school work to catch up on, and it's seriously beginning to overwhelm. Luckily, my math teacher is not a stickler for turning things in on time, so I have a little leeway in that class. If it doesn't get done by Friday, no big deal. I do have to take a test by tomorrow night though. The big stressor is the English paper due on Friday. I just can't seem to get my brain to engage on the topic. The effects of point of view on the reader from one of three short stories. Sorry, just don't care. I have nothing to say on that topic, so I'm having a hard time even faking it. Sigh. Nothing too major and dramatic thankfully, and I know it could completely be a million times worse so I am not complaining. Just venting about all this craziness that is piling up on the plate. Just gotta buckle down for the next 2 days and get it done. Then I shall lay out by the pool all weekend in my fabulous new swimsuit (not the 75 year old woman kind) and relax all my stresses away. 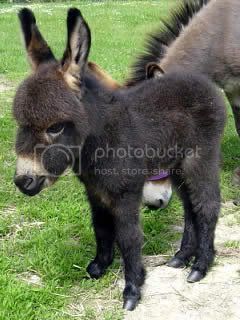 And in completely unrelated news, how flipping cute is this miniature donkey?